Ducklett (in Japanese: コアルヒー ” Koaruhie”) is a Water and Flying dual type Pokémon. It was introduced in the Unova Region (Pokémon Black and White, or Generation V) in 2011. 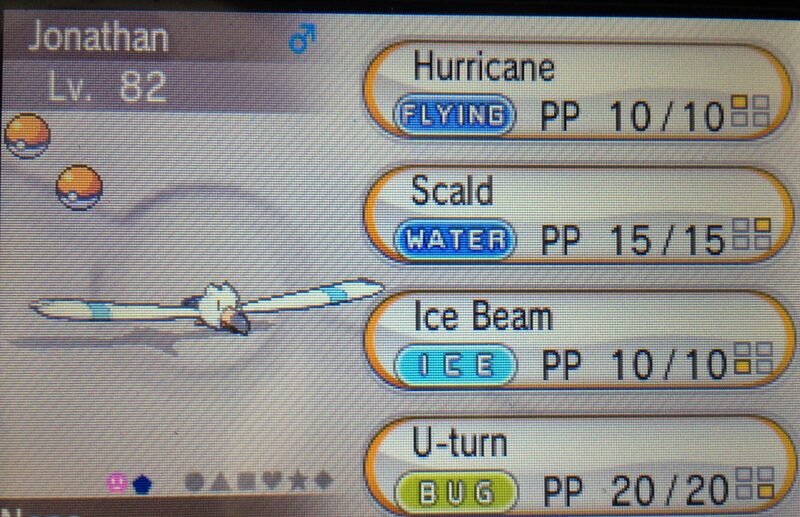 It evolves into Swanna (in Japanese: スワンナ “Swanna” ) at level 35 where it remains a Water/Flying dual-type. Reference: Bulbapedia. 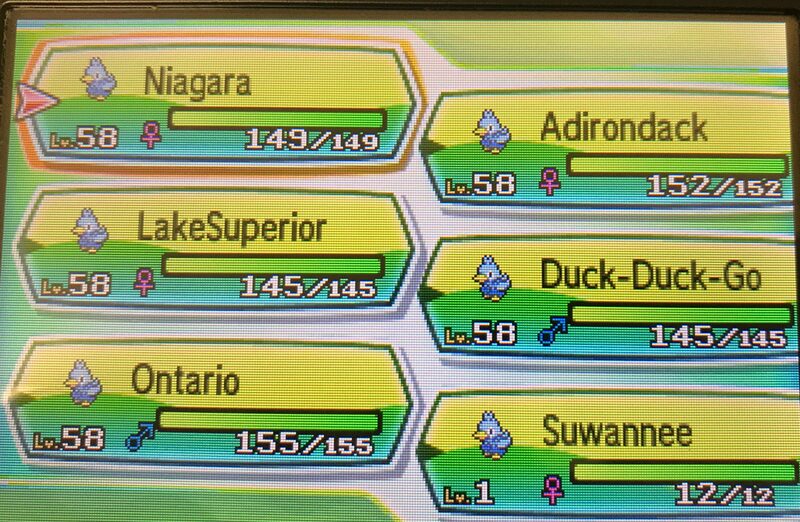 I envision that these two Unova waterfowl would like the lake environments of northeastern North America, the Unova Region being New York. 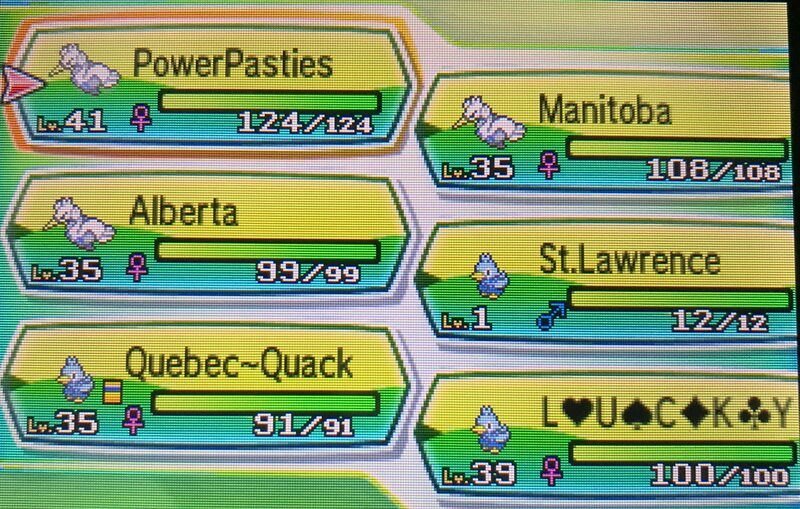 I like to give male Ducklett names like “St. Lawrence” or “Hudson Bay”. Any of the names of the Great Lakes would be a good name. “Ontario” is my favorite male Ducklett name. I also like Canadian references, “Toronto” for example. I’m am not sure if I could ever get down from this duck! Ha! Other duck jokes are linked here. “Quebec” or “Quebec Quack” are good sounding duck names. (I can almost hear in my mind’s ear those quacking sounds. Make that — French quacking sounds.) These names are based on “Quebecois” or Québécois — the name for French Canadian nationalists who want Quebec Province to gain independence from Canada. “Le Duc” or “Frenchie” may be interesting names. “Niagara” is named after the famous waterfalls American newlyweds go to. “Adirondack” after the mountain and lake region in upstate New York which is a great source of drinking water for NY. A Pokémon duck could be named “Duck-Duck-Go“, after the search engine. Users are moving to Duck-Duck-Go because they are tired of Google’s censoring of ideas, and the burying of articles which are counter to Google’s corporate narrative. Just ask James Damore . You may think of your own “lake” names for these waterfowl. Famous lake names like “Titicaca” are amusing. 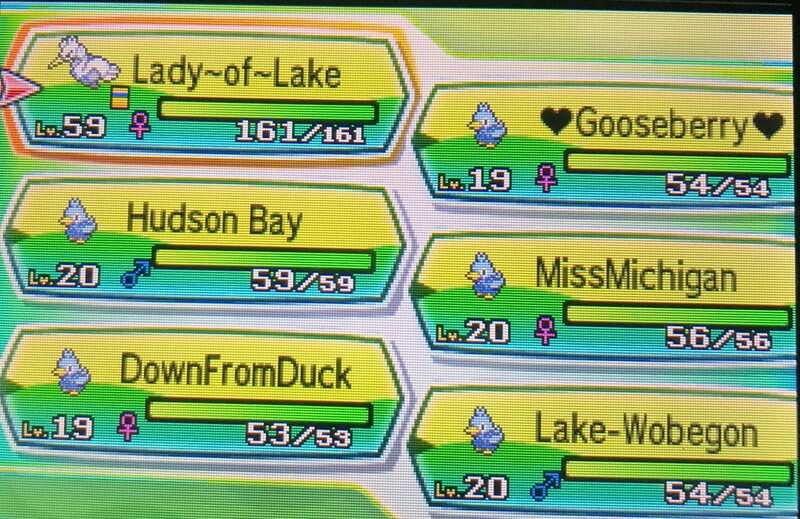 I wanted to name one after the “Lady of the Lake” from the King Author legend, but there are not enough spaces. 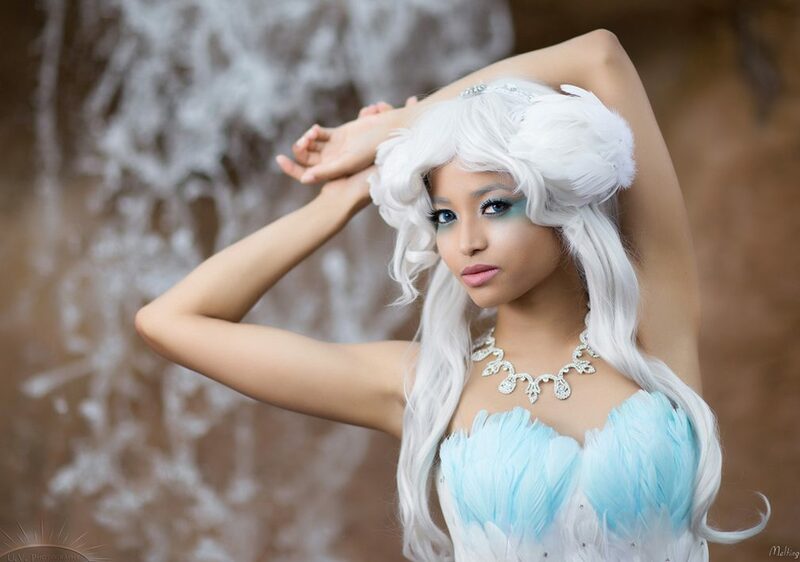 Everyone know the tale of the “Ugly Duckling” who grew up to be a beautiful swan. So that means the duck in the story was really not a duck. A young Swan somehow got mixed in with duck eggs? Or maybe a mother Swan on somebody’s farm died, and a farmer put the Swan egg in with a mother Duck’s eggs. The poor bird, thought it was abnormal, grew up a troubled youth, when in fact it was actually superior to the other fowl. Lesson learned. Some people do better as adults. I can see how there is a 50-50 ratio of Male-Female Ducklett, but I think that Swanna looks female by default. I prefer a female Swanna, as it has those two blue breast plates. They look like bra cups … which would not look right on male waterfowl. 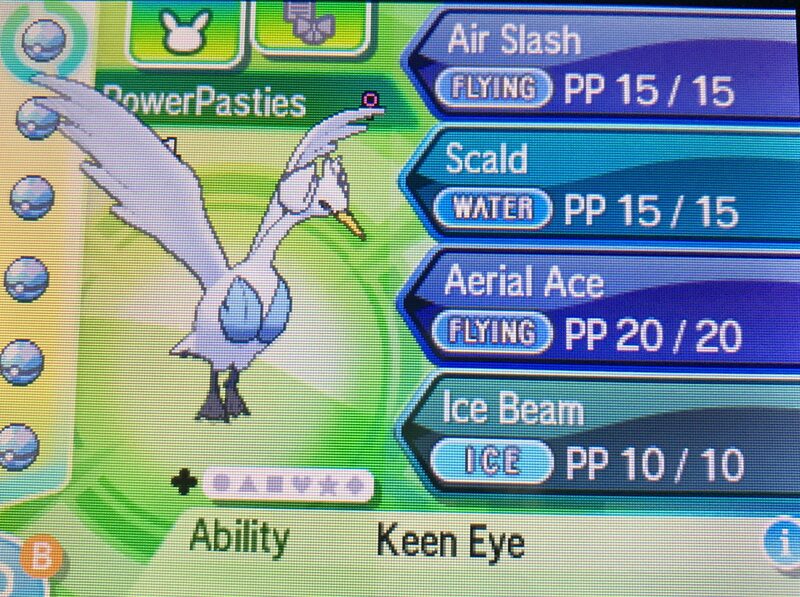 I like a Swanna to have a high Special Attack stat, and teach it moves like Air Cutter, Scald or Ice Beam. The animation kinda looks like the beam is coming out of the breast plates. This reminds me that maybe a male could shoot out a beam, if he were using special “Power Pasties”. What are power pasties you ask? Well obviously you are not familiar with the famous scene from the cult film “Flesh Gordon”. Oh, the seventies … and I digress. “Swanee” could be a name after the song “Way Down Upon The Swanee River” which was often sung in minstrel shows. You have to take that in a historical context. The actual name of the real river is spelled “Suwanee” after the American Indians who lived there. Of course, “Swan Lake” is a great name, after the famous Tchaikovsky ballet. 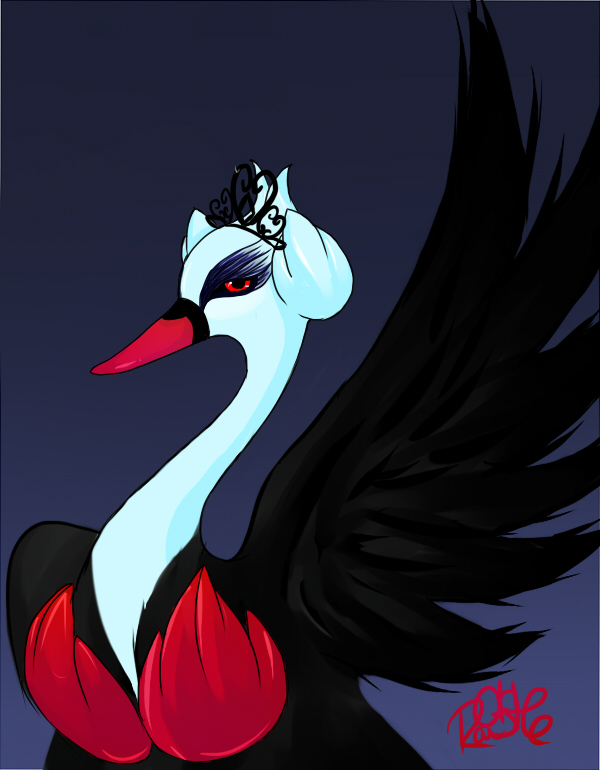 You might think of “Black Swan” after the movie. The shiny version of Swanna is purple, not black however. 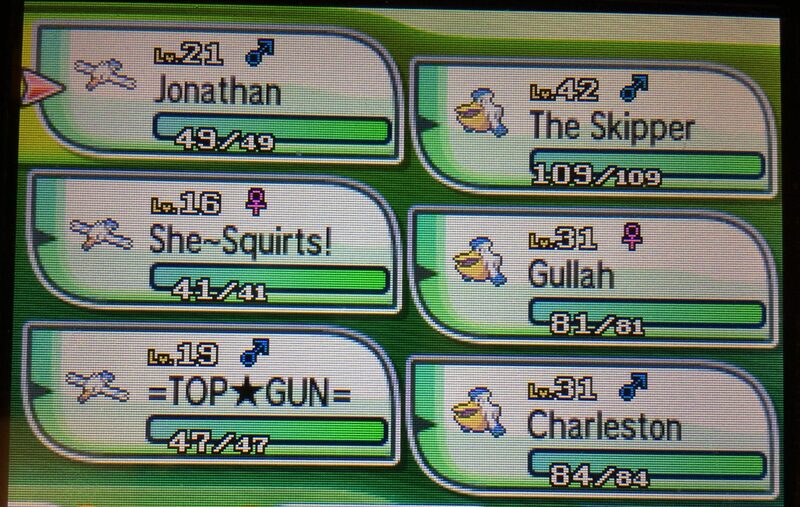 You may also want to consider other “duck” names I have used for waterfowl Pokémon. Please see my links here for Psyduck and Farfetch’d. What is the name for your lucky-duck-turns-into-swan transformation? Please comment! All photo credit goes to my little buddy. 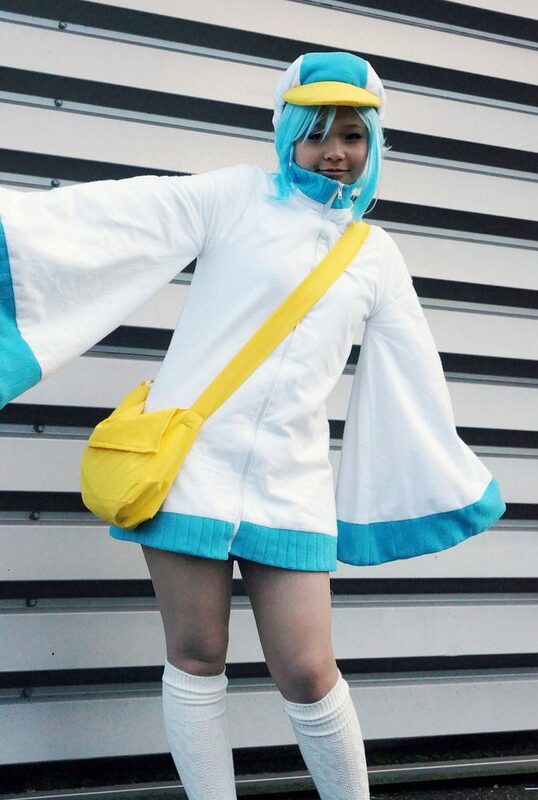 Wingull (in Japanese: キャモメ “Camome”) is a WATER and FLYING dual-type Pokémon. 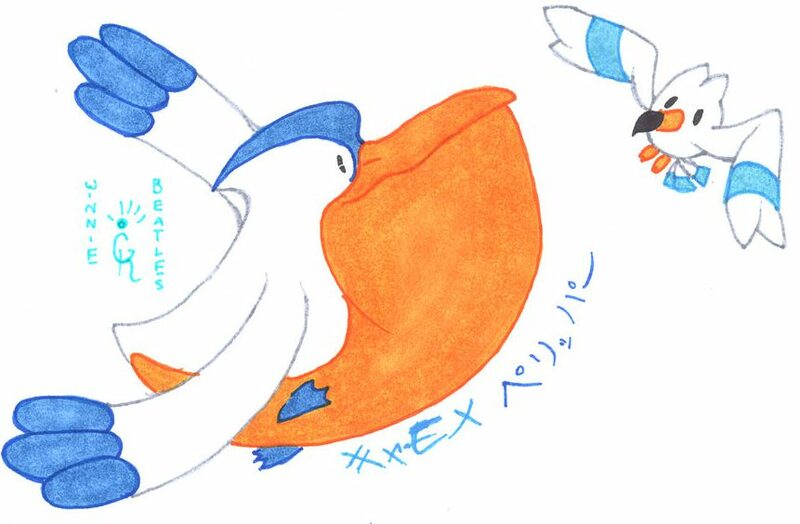 Wingull evolves into Pelipper (in Japanese: ペリッパー “Pelipper”) when raised to level 25, where it remains a WATER and FLYING dual-type. Credit goes to the artist (Whatshername). Among my favorite names for Wingull are “Jonathan” or “Livingston” after the philosophical book (and later movie) by Richard Bach called “Jonathan Livingston Seagull.” Trailer linked here. Follow your heart — link here. I also like to name them “Top Gun” (and also use the star-symbol), after the 1980s movie of the same name. Wingull usually knows “Water Gun” which is one of the cutest Pokémon moves, although I eventually replace it with stronger moves like “Water Pulse” or “Scald”. I put one out on the Wondertrade named “She Squirts”. I also used the names for coastal places where there are a lot of seabirds. A good name for Wingull is “Nantucket” after the island and the famous dirty limerick. If you are a student of American comedy history, you can appreciate the names “Gertrude” and “Heathcliff” after the famous comedy bit by the late-great comedy legend Red Skelton. Another possible Wingull name is “MineMineMine” which was what the seagulls were calling in the movie “Finding Nemo“. I have named Pelipper “Skipper” after the Skipper from the Giligan’s Island TV show. Once I went on a theme-naming spree, and named Pelipper “Alan Hale”. You could make a Double-Battle team with a Pelipper and a Wingull named “The Skipper” and “Little Buddy”. Of course, your opponent would have to be familiar with that 1960s TV show. A good name for a male Pelipper would be “Charleston” after the beautiful South Carolina city. You may want to use other coastal names where pelicans live. Perhaps “Carolina” or “Myrtle” after the staes or the town of Myrtyle Beach. A name that would work fro female Wingull/Pelipper is “Gullah” the name of the dialect spoken by the African-American residents of the “Sea Islands” region of Georgia. The dialect was preserved due to the island’s relative isolation from the rest of Georgia. 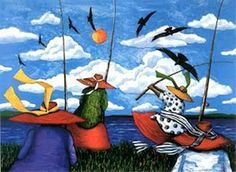 Credit goes to the original Gullah region painter. The people who speak the dialect are sometimes referred to as “Geechee” – but be careful – the word has been used as derogatory slur. You might use this Pokemon name, but do so only to honor the unique historical culture of the region. See you in Charleston, Gullah!